Hello ... Hello ... my old friends ... It's great to see you once again! ELO Beatles Forever [ELOBF] is pleased and proud to support not only local, national and international independent artistes in the ELOBF universe but also local businesses such as Vinyl & Vintage. For many years Yours Truly KJS have trawled second hand record shops looking for elusive ELO [and related] rarities and, as vinyl has made somewhat of a comeback with quite a few ELO & Jeff Lynne vinyl releases in the last year or so, it's refreshing to still have good record shops like Vinyl & Vintage plying their trade in Wolverhampton city centre. 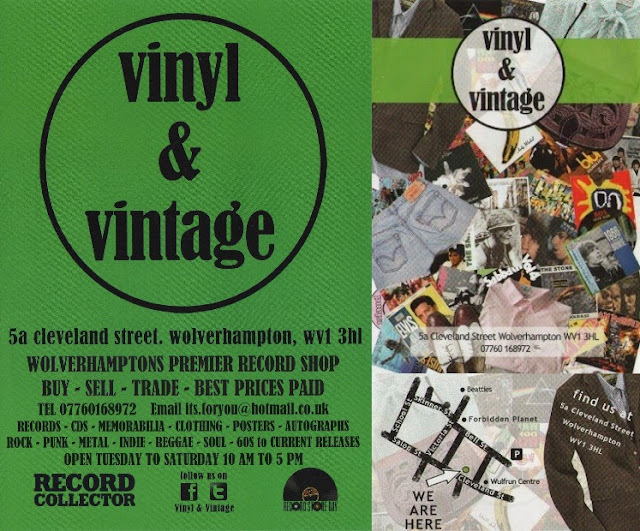 For that reason alone, ELO Beatles Forever [ELOBF] recommends Vinyl & Vintage to those enlightened folks who enjoy the music of ELO & Jeff Lynne, Roy Wood, The Move, The Idle Race, 'Brum Beat', The Beatles and related artistes.